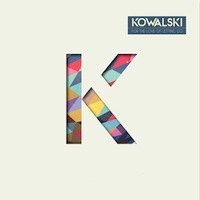 Irish indie electro group Kowalski cooks up an electro pop collection fit for the modern age. In For The Love Of Letting Go, the group puts together ten tasteful tracks that swirls on the flavors of electro and disco pop. Forfey welcomes the listener in a solid pop embrace. Electronic musings combined with some rapid drum strums creates a laid-back yet powerful sonic experience. Encapsulating the sun, sand, and the sea is Sunroom. With hints of surf rock, this sonic gem will surely transport you to warm summer days by the beach. While We Drive, on the other hand, relies heavily in the smooth sailing guitar strums and atmospheric melodies. Experimenting on harmonies and varied instrumentation, Get Back showcases the band’s potential to step out of their box, yet still cast their unique brand. Closing up the album is Let’s Start Over, a intensely chill album that’s perfect for that weekend drive to the country. In this For the Love of Letting Go, Kowalski has transformed synths, electro, and pop into a pristine sonic machine.